Found in Samir Selmanovic, It's Really All About God: Reflections of a Muslim Atheist Jewish Christian, p. 108.
Who would expect big Thomas to say such a thing. Absolutely! I am enjoying a number of the wonderful poems in your book. I am finishing it this evening. Very hopeful! Thank you! 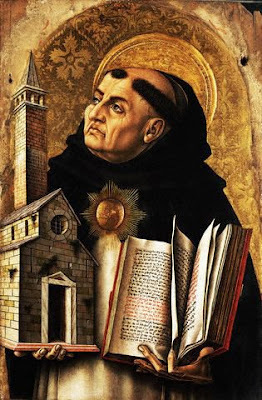 Thomas Aquinas is much misunderstood. Unfortunately Matthew Fox's book about him is nearly impossible to find. I have a xeroxed, GBC-bound copy, which I got from Matt for the class on Aquinas he taught at the now-defunct University of Creation Spirituality back in 1997. The book is "Sheer Joy: Conversations with Thomas Aquinas on Creation Spirituality." I'll share mine, but you have to come to West Virginia to read it . . . there may be copies floating around out there in libraries. I will look for it. Big Tom wasn't a big part of my seminary education. The perception was that he was a dry scholastic with an opaque theology enmeshed in a medieval world view. I am willing to have my perceptions changed on that! Cool! Maybe we should start a new thread called "Aquinas and Jive" -- has a nice double entendre.